We’ve been busy with our rental properties over here at the Hermits’ Rest Enterprises area of the business. 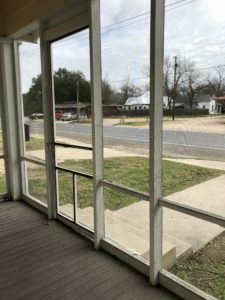 When we moved out of the Travis Avenue office, it morphed into the new home of our friends Mike and Martha, who plan to use the warehouse for a business, eventually. They are already making some great improvements to the place! Huge windows and really good ceiling fans make the bedrooms comfortable. Next we needed to work on the house where Mandi lived while the Rattlesnake House was being renovated. 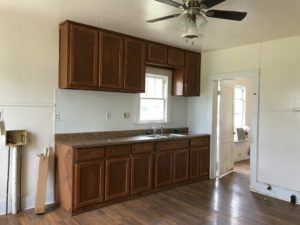 It had taken some abuse from dogs and four kids living in a two-bedroom house, so we got David and Kim on the project of making it ready to rent to a new family. 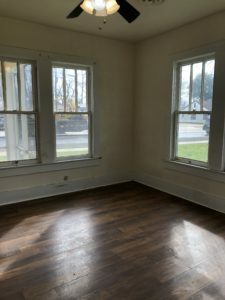 Windows have been repaired, painting will be done, and some flooring issues have been addressed. We still need to get appliances in the house and a good clean-up. Why do we do all this? We want our renters to see that we value our properties, so that they will value them as well. And keeping the house in good shape means we will have to do fewer repairs while tenants are in the house. My favorite part of the house is the screened in front porch. If you are interested in renting, please contact Mandi at (254) 760-4411 for more information. Stay tuned. Other possibilities await! It all looks brand new. 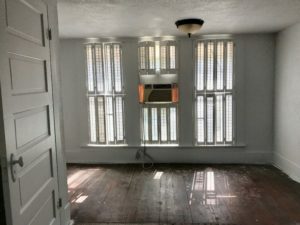 I think we’ve mentioned that the Miracle Method people were coming from Waco to work on the Travis 1 house, where our office has been for the last year and a half. This has been a perfect excuse for Mandi to get out of the office and work on moving into the Rattlesnake House. Removed the heinous shower surround in the upstairs bathroom. A shower curtain will be WAY better than that thing. Resurface the counter top in the downstairs bathroom. 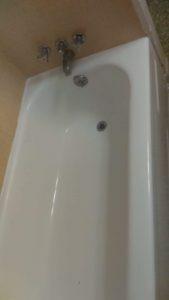 We plan to replace the upstairs vanity and sink. 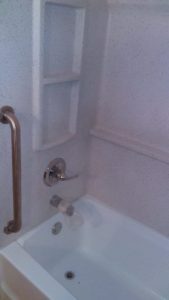 We will also change out the hardware on the downstairs sink and upstairs bath. The new tenants should be pleased. We promise to get some better photos soon, when Sue Ann’s camera is back in Cameron! Thanks to all you zillions of people who celebrated along with us as we officially acquired the Hermit Haus property. Since then, I’ve been starting on a website, which is nowhere near finished, but you can look at it, if you want to. 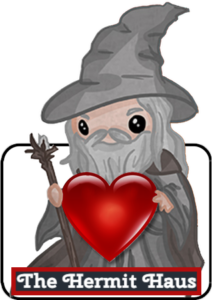 And we have a temporary logo, featuring the friendly Hermann. We at least now have a presence! We’ll let you know when there’s a Facebook page and all that, but until then, we will put updates on the Hermits’ Rest Enterprises page. 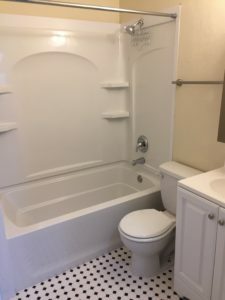 Travis 1 Has a New Bathroom! I don’t think this bathroom has ever looked so clean and fresh! How exciting that the bathroom remodel on the Travis 1 house is finished! 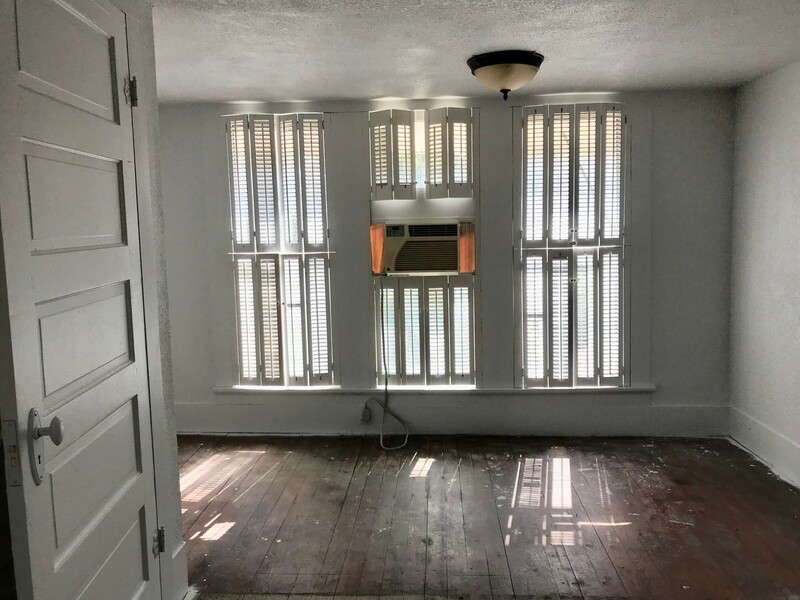 It has gone from being a boring, outdated space with a horribly place window just begging to leak, to being fresh, clean, so cute, and that nasty window is GONE! It was really feeling like the project was just never even going to get started. The contractor that had won the bid to do the job just disappeared. Have no fear, Mandi knows people. That’s where Ryan comes in. 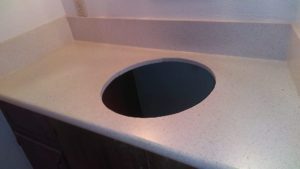 Originally he was only going to replace some light fixtures and by the time it has come to a close, he has done that, numerous other odds and ends that no one saw coming, and he has rebuilt that tired bathroom. Please check out these pictures of the new bathroom. It’s really very nice and it is ready for the final touches of decorating to be done with it. I am usually not a fan of the black and white floors, but I really like this that Sue Ann picked out. Ryan did a fantastic job putting it in and I really think I may have to rethink what I feel about the black and white floors. Let’s get back on topic. How are those projects doing? Here’s a brief rundown. Wow, even without the carpet, the master bedroom in Taylor looks so much better. Painting those shutters helped a lot. We are waiting on getting it repainted, since there’s a buyer who is interested, and we said we’d paint it whatever color she wanted. Just waiting on another house to sell. Typical! It’s on the home stretch! Anita has just about wrestled the shed/apartment to the ground (and a dirty job it was! ), and she just found out that the carpet in the main house can be installed tomorrow. That’s good news. Other than that, the house needs some fake rock installed in the front and the stairs painted dark brown (that will be last). We’re waiting for our contractor to finish another job before that can be done, but since the other job is near Bobcat, we pester him about it when we drive by. Once that’s done, Taylor Homestead will be ready to go officially on the market. Let’s hope it is this week! We also have someone quite interested in it. Let’s send out positive thoughts. Those work, right?